Potty training is enough of a responsibility for most toddlers. Just imagine the burden when you're also your family's sole bread-winner. Baby Peggy coasted for her first year, at least if you consider spending your days and nights in a tent in Yosemite National Park the life of Riley. But after Baby's daddy Jack uprooted the family so he could play cowboy (as a stunt double for Tom Mix and others) in Hollywood, she learned that she was going to have to earn her daily bottle. Peggy-Jean Montgomery was discovered in 1920 by director Fred Fishback and the 19-month old was put to work as a co-star with Brownie the Wonder Dog. After poor little Brownie proved too gentle for this wicked world, Peggy was forced to strike out on her own. She struck gold. Baby Peggy became one of Hollywood's hottest commodities, shooting 56 comedy shorts over three years' worth of full work weeks. Peggy's precious reaction shots, surprisingly adroit stunt work, and ability to imitate stars like Pola Negri, Mae Murray, and Rudolph Valentino made her America's littlest sweetheart. The studio, along with her controlling father and banker grandfather, developed Baby Peggy into a major property with a line of merchandise covering the range from dolls to jewelry to underwear. She even shared the stage with FDR at the 1924 Democratic Convention. Or maybe FDR shared the stage with her. By the age of five, Peggy had socked away over a million bucks in a time when that wasn't a hedge fund manager's pocket change, and she was promoted to feature-length films as a contender to the now rapidly aging child star Jackie Coogan (stretching his shelf life as a doddering ten year old). Unfortunately it wasn't enough for papa Jack whose feud with a producer not only broke her multi-million dollar contract but allegedly got her blacklisted for life. The grandfather billed as a banker turned out to be more of a bankster and absconded with all of the funds of the Baby Peggy Corporation, leaving the Montgomerys almost destitute. Ever the consummate show biz professional, Peggy dusted herself off and shuffled off to vaudeville, logging even longer work weeks on the stage over the next several years, traveling the country on an endless tour. Several years of sweat equity bulged the family coffers to over $650,000 after which dad promptly lost every penny. Just north of ten years old, Peggy-Jean Montgomery had earned two fortunes and lost them both to incompetent relatives. She was ready for her next fresh start. Dutch filmmaker Vera Iwerebor was a little girl herself when she first saw a postcard of Baby Peggy, and the image fascinated her enough to eventually write a fan letter to Peggy Montgomery. The response came from a woman named Diana Serra Cary, already a suggestion of an interesting story to be told. 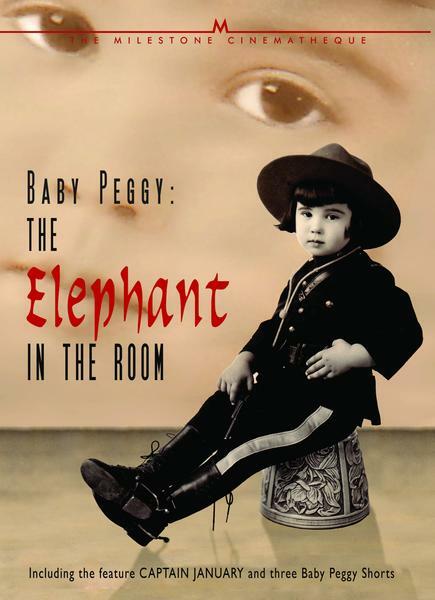 The two became friends, enabling Iwerebor to learn the rest of the tale and ultimately to share it with the world in this thoroughly entertaining documentary, “Baby Peggy: The Elephant In The Room” (2011). The Montgomery family returned hat-in-hand to Hollywood where they worked as extras, but vague promises of future speaking roles never materialized for the former superstar. Peggy eventually left the family, finding love and religion while forging an entirely new identity as Diana Serra (the first name from a favorite actress, the last name from Franciscan friar Junipero Serra). She ran a bookstore, founded a greeting card company (conveniently marrying artist Bob Cary to help with the venture), and wrote several books on film history, mostly chronicling the biographies of child stars from Jackie Coogan to, of course, Baby Peggy. Not bad for a woman who received almost no formal education because she was working full time while still in diapers. A good chunk of the documentary consists of footage shot over several days around Mrs. Cary's 90th birthday in 2008. In some of the most effective passages, she explains to her granddaughter Stephanie that she never had much of a childhood. She remains unfamiliar with most kids' games (Stephanie had to explain the concept of hopscotch) and admits that she quickly grew to resent Baby Peggy, a personality she considered distinct from herself, even staging a ceremonial burial for her infant alter ego. But several decades later, she became curious about what was left of the child star's legacy and has even grown fond of her once again now that several of the shorts (about 12 of the 56) have been rediscovered and have recently played to appreciative audiences. Iwerebor must have had a difficult time winnowing this film down to its trim 54 minute running time. Both Baby Peggy and the adult Diana Serra Cary are remarkable ladies who deserve their own projects. The documentary benefits greatly by playing off their distinct charms; Baby Peggy beaming precociously from another century, and Mrs. Cary speaking so eloquently today. It might have been a sad film if the two couldn't be friends, but now that they seem to have reconciled we're left with an inspiring portrait of a great and no longer forgotten Hollywood star. The documentary is narrated by actor Simon West, and the narration is co-written by Mrs. Cary. The film is presented in 16:9. The new footage shot by Iwerebor looks just fine in standard definition; it's almost exclusively interviews or material recorded at a silent film festival. 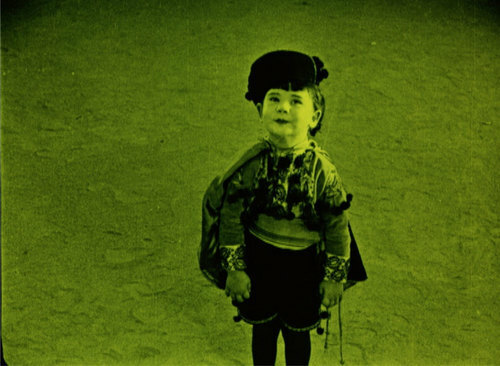 The silent film clips obviously vary greatly in quality as well as in aspect ratio, but none are so hopelessly damaged that they interfere with viewing. All of the dialogue is clearly recorded and, obviously, there are no audio concerns regarding any of the film clips. No subtitles are provided. Milestone never fails to deliver great DVD packages. While they didn't call in any film scholars to chip in with the project, they have included the most important supplemental material: Baby Peggy films. As mentioned above, only about a dozen of the 56 Peggy shorts are currently known to exist and most were found in European film archives. Three of them have been included here and they're really a blast. “Carmen, Jr.” (1923, 11 min.) casts Peggy as a fiery senorita who embarks on “a Latin love adventure” which mostly involves dancing until she gets dizzy and taking the ring as a brave toreador taming a man in a cheap bull suit. “Peg O' the Mounted” (1924, 12 min.) moves Peggy north to Canada where she rescues a Mountie and tracks down a band of moonshiners. She even rides a tiny horse in this one. “Such Is Life” (1924, 17 min.) isn't quite the same escapist fare. Peggy is found homeless in the snow, but the plucky little bugger dives right into a career as a match girl and saves another child from a fire. There are obviously a few shots or scenes missing from some of the shorts, producing a few abrupt jumps in the storyline, but overall they look fairly good, or at least as good as anyone could reasonably expect from films that could easily have been lost forever. Peggy's brief sojourn into full-length filmmaking is also represented with the only feature that survives intact. “Captain January” (1924, 58 min, directed by former Keystone Cop Edward F. Cline) situates Peggy as the title character who washed ashore during a storm and was unofficially adopted by aging Maine lighthouse keeper Jeremiah Judkins (Hobart Bosworth). I was really caught off-guard by this moving story. Daddy Judkins is asked to give up his li'l Cap'n for her own good, and the tug on the heartstrings is undeniable. Peggy tends to her menagerie of pets (including a stork named Hamlet who gets renamed Ophelia after laying an egg) but is caught off-guard by a parrot who squawks “Go To H---!” in one of the more unexpected shots I've ever seen in a silent film. Watching the movies, I was struck by the notion that they provide evidence that those primitive audience from long ago liked to spend their free time watching kids and pets do funny things. Peggy's charm is undeniable as well, and it's easy to see how she won over the hearts of so many viewers. I'd happily watch more if they were ever released. The shorts are accompanied by scores performed by Guenter Buchwald. "Captain January" has a score by Donald Sosin with vocals by Joanna Seaton. “Baby Peggy: The Elephant In the Room” succeeds both as a record of a film history seldom told, and as a portrait of a remarkable woman. The journey from Baby Peggy to Diana Serra Cary is a story of determination and constant reinvention, and director Vera Iwerebor has captured it all vividly. Milestone's handsomely produced DVD includes three Baby Peggy shorts and a Baby Peggy feature that fill out the story and would be worth a purchase all by themselves. As mere “extras,” they sweeten the pot considerably, making this one of the most enjoyable DVD releases of the year. For more information, check out the link at Milestone's site. You can also find more information under the Press section linked at the top of their page.